Easy Access Bandages™ are the BIGGEST INNOVATION to bandages since Adhesion! One handed application is as easy as 1-2-3! Just grip, pull, and stick! 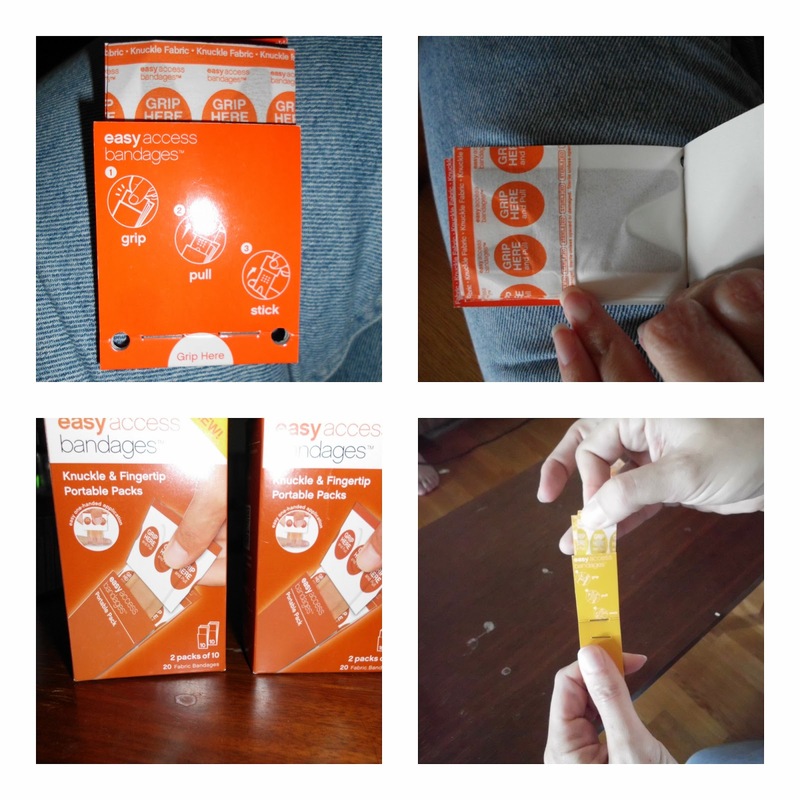 Easy Access Bandages™ are secured in portable packs that slip into a pocket or purse for easy transport without damaging the bandages. The packs are also organized by size so it is easy to find the size you need when you need it. Easy to apply with less mess and no loose tabs, the one handed application also minimizes contamination risk. Sterile and latex free." I was sent a wonderful selection of bandages. When my little ones get a little bump or bruise they seem to think they need a bandage. No need for blood to be present to cover it up! Have that in your home too? Well if it makes them feel better than it is well worth it. These bandages help them to help themselves as well. With no hard paper to tear and pull apart, the bandages are easy enough for a toddler to do. The variety of sizes is wonderful. Best is that they are organized and held together! No more trying to locate that specific size while dealing with a crying child. No more spilling the entire box of bandages all over the floor either. I have done that! Not only are the bandages easy to use, they are pleasing to the eye! I don't care for flashy bandages that draw attention, I prefer mine to blend in. The bandages are made of flexible fabric which makes the easier to use and to remove. I prefer these type to plastic bandages. We did not have any adverse reactions to the bandages at all. They did not bring any skin discomfort. A must for all Moms! Enter to win an Assortment of Bandages from Easy Access! What I think I would like best is not contaminating the bandage while you are putting it on.. had a few band aids that I had rolled on me and had to pull apart. Quick to put on a toddler that is upset. I like that they are easy to open. I hate it when I have a cut on my finger and can't get the band aid out of the package. I love that they are easy open which is great for cut fingers and that seems to be our most common type of cut. One handed application. it's hard to apply a band aid on yourself with out it getting messed up. I like that they are available at Walmart and they are Latex free and that you can apply with one hand, which is great when you have a screaming, crying child you are trying to take care of and bandage a boo boo.. I really like how easy they can be located and opened. With the bandages I use now, I have to fish around in the box, looking for the right size, while trying to hold a Kleenex over whatever is bleeding. Also, I always end up with the pieces either falling on the floor or having them stuck to my clothing because of the static. It is about time someone invented a product like this. Thank you for the great giveaway opportunity. Keep up the terrific blogging. I do like that these have flexible fabric and the seem comfortable to use.